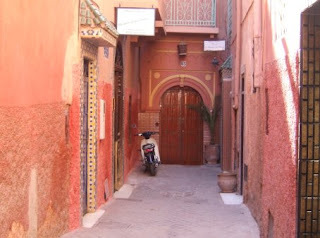 Well, just one more today... here's the street where we stayed in Marakech - Derb de Toureg. We are in the little guest house under the sign on the left - a beatifully restored old Marakshi house run by a Frenchman - Guy Barbaste - with the help of a small but wonderful staff. Mohammed and Zura took great care of us, and on our last evening there Zura served up a fantastic tagine of chicken with lemon and olives.